1860 Baku's existing Khan pipeline, fed by wells from the foot of nearby mountains, fails to meet the city's growing demand for water. Baku's mayor decides to divert water from the Khan pipeline to a reservoir at the Tsitsianov Fountain (located higher than the present Fountain Square) via an underground canal. 1865 Construction of the new reservoir begins under city architect Gasim Hajibababeyov. Planners fail to take into account the future needs of Baku's rising oil industry, located on the outskirts of town. 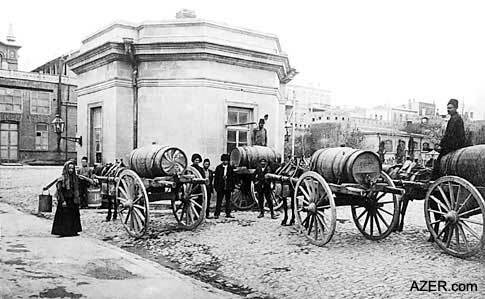 1866-67 The city spends 5,000 rubles to lay two central water pipelines. Many of the suburban residents who do not have access to the water system are prohibited from drilling new wells or deepening existing ones. 1869 Construction of the Mariinin pipeline begins, going from the Tsitsianov Fountain to Mariinin Garden (the garden named after Khagani). 1870 The Mariinin pipeline becomes operational but fails to provide Baku with an adequate water supply. Engineer Shebanov finds large sources in Buzovna and "Wolf's Gates" (Gurd Gapisi), but his project is abandoned because of its inordinate expense. 1873 A 170-sazhen (1 sazhen is equivalent to 2.13 meters) section of the Khan pipeline gets clogged up, preventing the flow of water to the reservoir. Shebanov is appointed to study the reasons for the breakdown and to reconstruct the pipeline. A special technical commission of architects, military technicians and mountain engineers is organized. 1879 Baku mayor Zenovich demands that the Baku Duma consider the question of water supply. Oil baron Taghiyev convinces the Duma "to assign 1,000 rubles to the town council's disposal for finding a water source and putting together a project for a new water pipeline." 1880 A special commission appointed by the Baku Duma begins its search for water on Absheron. They are disappointed to find that the Zaghulba source near Buzovna only provides 50,000 buckets of water per day. Other nearby sources are no more promising. 1884 Baku Duma member O. Lents suggests bringing water from southeastern Absheron. He is given 14 months to research the idea. 1885 An initial well dug in "Mashtagha Dam" ("Mashtagha bandi") is found to supply 25,000 buckets per day. When chemists determine that the water from Absheron is too salty, this setback puts a complete stop to efforts to support Baku with drinking water from nearby sources. The Baku Duma considers building seawater desalination plants and a water pipeline from the Kur River. 1890 Engineer Konradi carries out research in the Dibrar region in the upper reaches of the Chakil-chay and Pirsaat rivers. He finds enough water to supply Baku, the Black City (Gara Shahar) and the Balakhani-Sabunchu industrial region. However, Baku's water supply commission turns down the 3.5-million-ruble project because of the risk from earthquakes, landslides and drought. The Kur variant is considered unsuitable for supplying Baku with water. 1899 The Baku Duma asks British engineer William Lindley to find a water source. Lindley settles on mountain sources in the Guba region. With the support of Alimardan Topchubashev and Taghiyev, the Baku Duma awards Lindley the contract. 1903 Lindley's project to tap the Samur River is delayed by bureaucratic obstacles and political events in Russia. 1912 Czar Nicholas II passes a decree to allot land for the pipeline project. A plant is built in Khachmaz to manufacture the pipe. 1914 World War I creates a workforce shortage, further delaying the pipeline. The Baku Duma requests that Russia exempt pipeline workers from conscription. 1917 Celebration of the Baku-Shollar pipeline at Krasnovodsk Street (now Samad Vurghun) in Baku. Taghiyev, who had contributed 25,000 gold rubles, gets the honor of opening the tap. Dr. Mamad Mammadov holds a Candidate of Historical Sciences degree and is a researcher at the Azerbaijani History Museum. This chronology is compiled from his articles published in Vishka newspaper, Baku: "Will There Be Water Today?" (Dec 15, 2000), and "The Shollar Water Pipeline is 85 Years Old" (Feb 1, 2002).